Two weeks ago I wrote about a design gallery and store in Brooklyn called Spring. This week, I want to give you a close-up of some of the fabulous designers they represent. 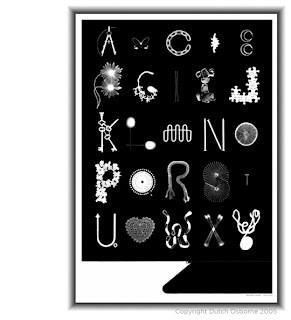 This unusal alphabet poster, called ABC Photogram, by Dutch Osborne caught my eye. Co-owner Anna Cosentino tells me it is sold exclusively at Spring, but lucky for you it is also available in their online store. 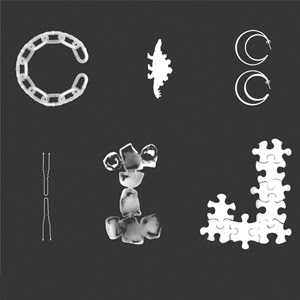 C is for chain, D is for dinosaur, E is for earrings… see if you can help me figure the other ones out. 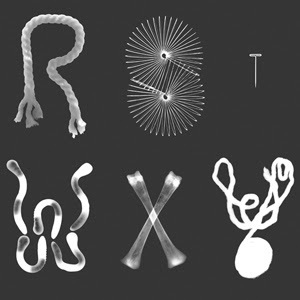 Osborne experimented with found objects – bits and bobs from mechanical parts to toys – whose shadows he captured using photograms. He limited himself to using objects whose size he would not have to manipulate, so that the final image is the exact dimension of the original piece. That’s quite a feat when you realize he had to find 26 shapes that would work well together on one large sheet of paper. Brooklyn-based textile artist Elodie Blanchard also uses text in her designs. Her Top Searches in Google News cushions are a witty comment on how much the Internet has invaded our living spaces. The cushion above shows the top Googles results for 2007. All the pillows are made in signed, limited editions of 250, and are available in Elodie’s etsy store. I guess its no surprise who tops 2006’s list (above), but I’m a little put out to discover that my crush on Orlando Bloom is shared with half of America. According to Google, in 2005 (above) Janet Jackson’s wardrobe malfunction was more of a media event than Hurricane Katrina. Go figure. Blanchard’s Favorite Dog cushions capture the silhouettes of the top 20 most popular breeds in America. 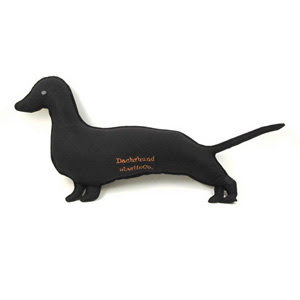 Here is the dachshund, but lovers of the chihuahua, pug and labrador retriever will be happy to know those are available too. There is much more where these great finds came from, so watch this space. I’ll be back next week with more ingenious designs from NYC.